Two films examining the same character, twenty five years apart? Intriguing. Join us as we digest The Hustler and The Color of Money. Do the hustle, do the hustle”, sang visionary Van McCoy in the 1975 Disco standard. They don’t write ’em like that any more. Words of advice that we assume Paul Newman took to heart, checks notes, fourteen years earlier in this adaptation of a Walter Tevis’s novel from, checks notes, 1959. This is still the time travel episode, right? 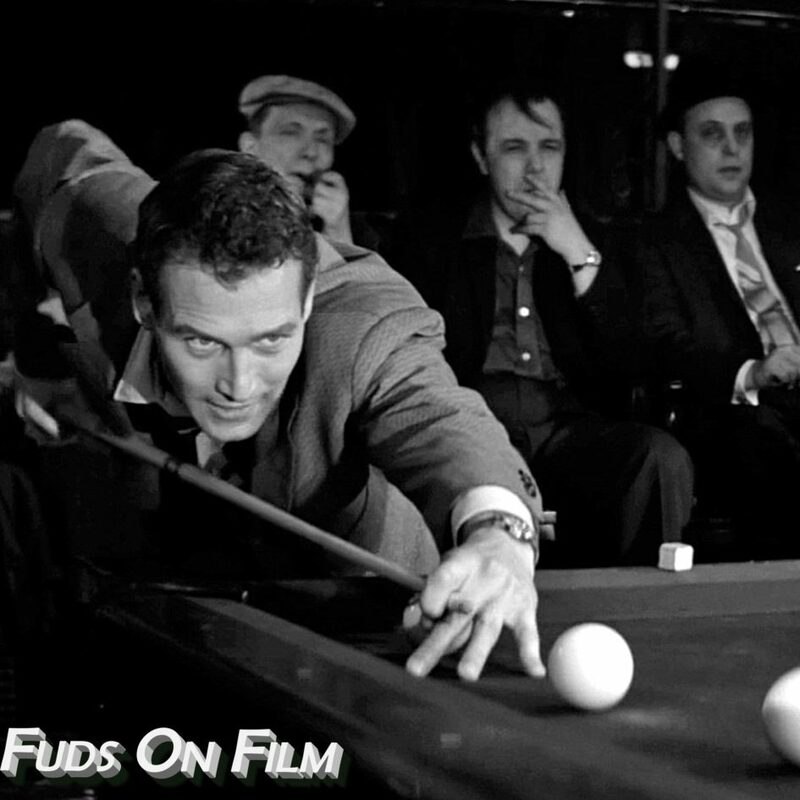 In The Hustler, doop doop doop doop-doop doop doop doop-doop, Newman plays a prodigiously talented young pool shark “Fast Eddie” Felson, which sadly means someone who is really good at smacking billiard balls around, and not a heavily be-toothed aquatic predator living exclusively in artificial ponds. He’s busy hustling his way around the United States of America with his partner Charlie, played by Myron McCormick, gambling and conning his way to making enough money to interest the legendary Minnesota Fats (Jackie Gleason) in a game. He gets to this surprisingly early, but in a marathon game that at one point sees Eddie achieve his stated aim of winning $10,000, he can’t stop himself going for broke, wanting to hear Fats calling it quits. He doesn’t, and as the night turns to day and Eddie continues drinking, the advantage swings to Fats who annihilates him. Charlie voices his disgust at Eddie’s hubris, and Eddie leaves, finding himself adrift anchored only by that dependable friend, alcohol. He finds something of a kindred spirit in Piper Laurie’s Sarah, an alcoholic part-time student, supported by her father with a number of self image issues, seemingly in part triggered by her slight mobility impairment. They embark on a relationship that’s initially, and Sarah would argue, continued to be mainly physical in nature. Eddie soon starts hustling again, bumping into one of Minnesota Fats’ gambling associates, George C. Scott’s Bert Gordon, who describes Eddie as a born loser. Talented, but no character. He thinks he can fix that, offering to stake him in the high-roller games for a 75% cut. Eddie laughs this off and returns to the smaller pool halls looking to work his way up, before hustling just the wrong character in just the wrong way to ensure that he’s given a solid beating, and two broken thumbs for his trouble. This sudden disability makes him more reliant on Sarah’s help than it seems Eddie’s comfortable with, his temper flaring up almost as much as the situation brings them closer. Sarah realises that she loves Eddie, but Eddie’s unable to say the words, because as we’ve probably established by now, he’s a bit of a tool. After healing, Eddie goes back to Bert and accepts his terms, bringing Sarah on the road to the Kentucky Derby, which I hear is Decadent and Depraved, where the big fish hang out. Sarah grows increasingly repulsed by this lifestyle and people, before Eddie’s increasing absorption back into his old ways and some pressure from Bert leads to her cracking in tragic fashion, committing suicide and breaking apart this setup. Later, a colder, more focused, vengeance seeking Eddie returns to again face Minnesota Fats, backed by Bert, and takes them to the cleaners while airing their very personal issues in front of a discomforted Fats. Eddie walks away with the cash, but under threat of extreme inconveniencing should he ever show his face in a pool hall again. And off Fast Eddie goes, never to be heard of again. Hailed a modern classic on release, with nine Oscar noms and two wins, one for Eugen Schüfftan’s excellent, gloomy pool hall cinematography, it will come as no surprise for regular listeners of this podcast that I’d not seen it until a few days ago – this rather being my sinister plan for these slots. I’m inclined to agree with Mr. Oscar’s opinion in this regards, as there’s an awful lot to like in The Hustler. You have to start with the lead performances, all of which are pretty good, if perhaps a touch melodramatic through a modern lens. Newman’s struggle with his character’s worse elements creates a compelling arc, and the relationship between the two damaged people is satisfyingly spiky. George C. Scott and Jackie Gleason provide able support, but it’s perhaps the dingy pool halls and their clientele that sell the atmosphere the best. For all this, the title is well chosen – it’s Fast Eddie’s character flaws and conflicts that drive the heart of the film, his struggles to reconcile his conceptions of winning and losing with the rest of the worlds’ and his growing self-awareness over the course of the piece that’s the reason this remains well loved. A quarter of a century later Paul Newman returns as “Fast” Eddie Felson in Martin Scorsese’s The Color of Money. After the events of The Hustler it seems that Felson has, indeed, kept away from being a pool shark, having entered the fake liquor business, or the stolen liquor business, or possibly both, while also owning a pool hall and doing the same job that George C. Scott did in 1961; bankrolling hustlers, like John Turturro’s badly-bearded Julian. His excitement in general, and in particular his love of pool, is reignited when he encounters Vincent Lauria (a too young Tom Cruise, with all of the hair, stacked atop his head), a young hustler in whom he sees much of himself. He decides to take Vincent out on the road, with the destination being a pool championship in Atlantic City, to teach him what he knows, make him a better hustler and also make a buck or thousand if he can. That is, until he doesn’t, and Vincent largely disappears from the film for a long time while Eddie, having apparently had some sort of breakdown because Forest Whittaker’s Amos hustled him (surely this is an occupational hazard, but it seems to really get to him in a “we didn’t really know how to write a character crisis” kind of way). Cruise of this era brings enthusiasm and energy in spades, but that’s not always a great thing. Indeed, his character here is like watching that clip where he’s jumping on Ellen or Oprah or whever’s sofa for two hours. Very annoying – deliberately so, in places, but that doesn’t help when watching it. Thankfully it’s more than balanced out by Newman’s powerhouse performance, perhaps better than in The Hustler. If The Hustler was about the titular hustler in the main, The Color of Money is about… well, I’m not sure what, is the problem. Certainly not the actual colour of money, the shades of which are not mentioned once. It seems like this was going to be about Newman teaching Cruise the tricks of the trade, then all of a sudden he’s booted out of the picture and it’s about Newman rebuilding his character, then suddenly it’s about a rivalry that’s blossomed out of hee-haw. For all the talent in front, and particularly behind the camera, there’s just nothing like a strong enough central narrative for The Hustler to move up to something special. Newman’s turn alone makes this worthy of watching, but we’re surprised to find so little to be enthusiastic about in a Scorsizzle joint.